I’ll admit, I’m an easy target for “grammar mistakes you need to stop making” lists, but they’re starting to get on my nerves. The latest one I saw — 15 Common Grammatical Errors That Drive You Completely Insane (on Buzzfeed, of course) — started strong, with “your/you’re” and subject-verb disagreement. But then, at No. 3, was split infinitives — and what drives me “completely insane” is not split infinitives, but people saying that split infinitives are wrong. They’ve never been against the grammar of English; someone just decided that they shouldn’t be split and dictated that as a Law of English (Grammar Girl has a great summary of this). In at No. 6 is punctuation outside of quotation marks, which is a style matter, not a grammar rule. People in other countries put periods outside of quotation marks and I’d guess our putting them inside drives them “completely insane.” Or not. Now, I’m an editor, and I teach editing, so I’m not saying let’s throw caution to the wind and just write whatever, however. There are conventions for professional English, and most of them are there for a reason: clarity, precision, accuracy, or all three. But lots of “rules” have crept in that have a) nothing to do with English grammar, and b) nothing to do with making writing clear, precise or accurate. (See over/more than, due to/because of and not using “that” for people as a few examples.) They’re shibboleths, or they’re outdated, or they’re simply misguided attempts at clarity that don’t, in fact, make writing clearer. These need to go, and we need to stop putting them in lists — and stop sharing lists that include them. Writing is hard enough without worrying about manufactured distinctions that add nothing to a sentence. 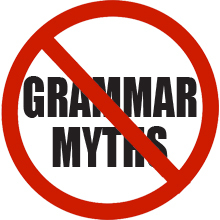 Writers and editors, and teachers of writing and editing, need to focus on the grammar problems — and there are plenty — that can impede understanding, mislead readers, or simply make a writer look sloppy and unprofessional, instead of sending more grammar myths around the Internet. Previous Happy National Punctuation Day! Recently, someone on Twitter linked to an article titled something like “10 Grammar Mistakes That Everyone Makes,” and I joked about writing a response called “10 Mistakes That Everyone Who Writes about Grammar Mistakes Makes.” I think I’d better get around to actually writing it.